Aston Villa boss Dean Smith said his side produced "a performance that merited the result" after his side eventually ran out comfortable winners at Derby County. Scotland midfielder John McGinn nodded in Villa's opener from Yannick Bolasie's left-wing cross in the 75th minute and then turned provider for Tammy Abraham to double the lead. Conor Hourihane's superb free-kick wrapped up Villa's first away win since their opening game of the season. "I said today was an opportunity to draw a line in the sand about what we can be and they've certainly done that, but their standards are up there now and that's where we want them to stay," Smith told BBC WM. "It gives everybody a boost. I said I wanted a team that was hungry and showed desire to go and create chances and we did that." 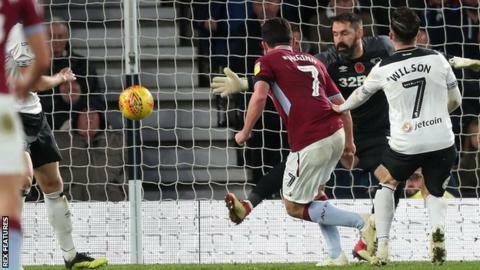 Villa ended Derby's six-match unbeaten run in the Championship, creating several good chances but failing to find the net until they scored three times in 11 minutes late on. McGinn, Abraham and Jonathan Kodjia had all been guilty of wasting opportunities at Pride Park as Derby struggled to contain their visitors, and the hosts could not hold out. Derby's best chances came in one frantic passage of play just before half-time, with Villa keeper Orjan Nyland keeping out efforts from Jack Marriott and Harry Wilson in quick succession. Otherwise, Villa were on top for the most part and recorded their biggest win of the season to climb into the top half of the Championship table. Smith was making his second visit to Pride Park this season, having lost 3-1 as Brentford boss in September, and it was starting to appear likely he would endure another frustrating afternoon against the Rams as the game headed towards the final 15 minutes. However, McGinn ghosted in unmarked to score his second goal for the club and England international Abraham netted his fifth since joining on loan from Chelsea to put the result beyond doubt before Hourihane's free-kick capped a fine day. "The first half was close and in the second half they were the better team, clearly, and created enough chances to win it probably by more. "If we're not at it as we weren't in the second half against a team with the quality of Aston Villa that's what you get. "We've had a great month and a game like this is actually a wake-up call and a reminder to all of us that this league is tough and if you underperform you'll get beaten and we need to make sure those games are rare." Match ends, Derby County 0, Aston Villa 3. Second Half ends, Derby County 0, Aston Villa 3. Attempt missed. James Chester (Aston Villa) header from the centre of the box misses to the left. Assisted by Jack Grealish with a cross following a set piece situation. Corner, Aston Villa. Conceded by Jayden Bogle. Substitution, Aston Villa. Scott Hogan replaces Tammy Abraham. Goal! Derby County 0, Aston Villa 3. Conor Hourihane (Aston Villa) from a free kick with a left footed shot to the top left corner. Attempt saved. Yannick Bolasie (Aston Villa) right footed shot from outside the box is saved in the bottom right corner. Assisted by Alan Hutton. Yannick Bolasie (Aston Villa) wins a free kick on the left wing. Attempt missed. Jack Marriott (Derby County) right footed shot from outside the box is close, but misses to the left. Assisted by Florian Jozefzoon. Substitution, Derby County. David Nugent replaces Craig Forsyth. Goal! Derby County 0, Aston Villa 2. Tammy Abraham (Aston Villa) right footed shot from very close range to the centre of the goal. Assisted by John McGinn with a cross. Goal! Derby County 0, Aston Villa 1. John McGinn (Aston Villa) header from the centre of the box to the centre of the goal. Assisted by Yannick Bolasie with a cross. Substitution, Derby County. Scott Malone replaces Duane Holmes. Substitution, Aston Villa. Yannick Bolasie replaces Jonathan Kodjia.